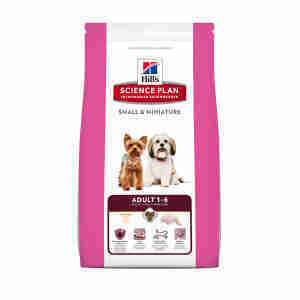 Hill's Science Plan Canine Adult Small & Miniature Chicken is made with high quality ingredients and the right nutrients, Hill's™ Science Plan™ is precisely prepared to offer your dog the nutrition he needs for lifelong health and happiness. Premium nutrition for healthy skin and a soft, shiny coat. meal, maize, wheat, brewers´ rice, animal fat, digest, vegetable oil, minerals, axseed, tomato pomace, citrus pulp, grape pomace, spinach powder. Calcium 0.81%, Phosphorus 0.69%, Sodium 0.30%, Potassium 0.69%, Magnesium 0.08%; per kg: Vitamin E 690mg, Vitamin C 105mg, Beta-carotene 1.5mg. 25.1mg, E5 (Manganese) 8.7mg, E6 (Zinc) 168mg, E8 (Selenium) 0.4mg, with natural antioxidant. Finally found a brand my munchkin will eat. Product smells nice so who can blame her. Nice small pieces. Seal on bag is more like Velcro & so much easier to close & open than the plastic strip on most brands.